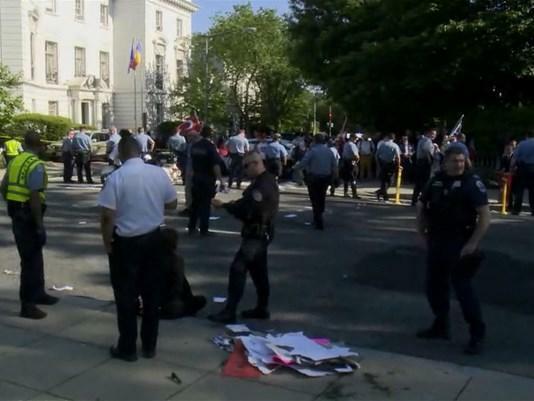 WASHINGTON -- Authorities say nine people were hurt and two arrests were made during an altercation at the Turkish ambassador's residence in the U.S. capital. Doug Buchanan, a DC Fire and EMS spokesman, says two of those hurt were seriously injured and were taken to hospitals by ambulance. He said by phone that emergency personnel were called to the residence about 4:30 p.m. Tuesday. Metropolitan Police Department spokesman Dustin Sternbeck says the altercation broke out between two groups but he didn't elaborate on the circumstances. He says two people were arrested, including one who was charged with assaulting a police officer. The State Department declined to comment on the altercation. Gunay Evinch told CBS affiliate WUSA that he traveled to the ambassador's residence to take part in the pro-Turkey rally when the group of anti-Erdoğan protesters charged across the street. "Those provocateurs were successful in getting exactly what they wanted," he said. "Which was to be responded to." The altercation came the same day that Turkish President Recep Tayyip Erdogan met with Mr. Trump at the White House, where the two leaders reaffirmed their commitment to combating terrorism and defeating ISIS. While Mr. Trump called Erdogan in April to congratulate him on winning a highly controversial referendum to expand presidential powers, the U.S. and Turkey have been at odds in recent weeks after the Trump administration said it would arm the Kurdish elements of the Syrian Democratic Forces (SDF). But during the photo op with Erdogan, Mr. Trump briefly offered his support of Turkey's fight against the outlawed Kurdistan Workers' Party, or PKK, which is on the State Department's list of Foreign Terrorist Organizations. The SDF fighters are viewed by Turkey as an extension of the outlawed Kurdistan Workers' Party, or PKK. The move to arm the SDF fighters is at odds with Turkey, which doesn't want the Syrian Kurdish-led force to take the ISIS de facto capital of Raqqa, and has offered its own troops instead. Erdogan had promised to convince Mr. Trump to reverse his administration's decision during their White House meeting. While neither leader would comment on the disagreement over the Kurdish forces, both appeared to agree on furthering cooperation in the realms of economy, trade, energy and defense. Mr. Trump also offered his appreciation to the Turkish leader in "seeking an end" to the killings in Syria, saying the U.S. will "suppport any effort that could be used to reduce violence in Syria and create conditions for a peaceful resolution." The president said that he looks forward to achieving peace and security in the Middle East and "working toward a future of dignity for all our people." Earlier, during their Oval Office meeting, Mr. Trump said the two leaders were going to have "long and hard discussions" that he knows will be successful. "We've had a great relationship and we'll make it even better," Mr. Trump said.